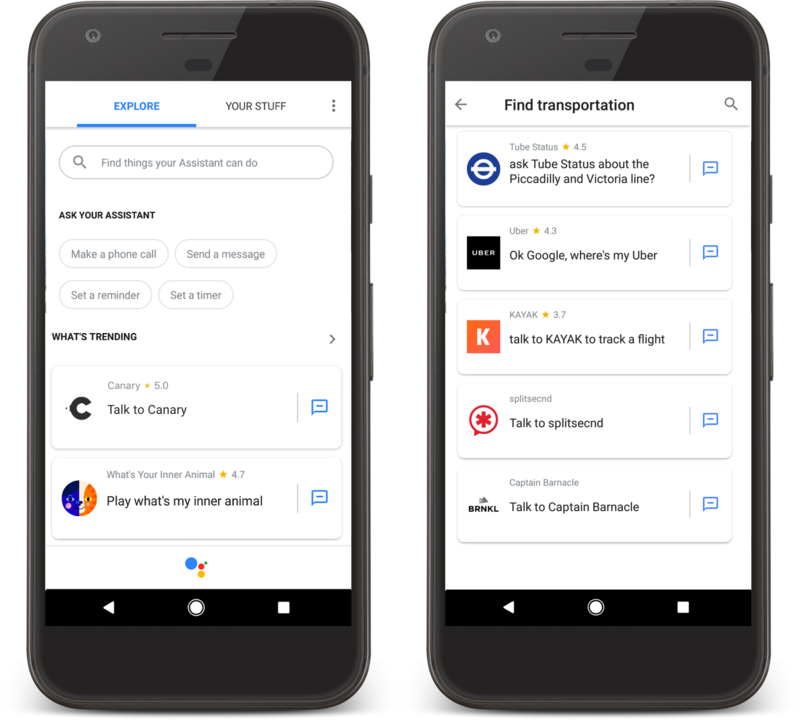 With more international support and updates to the Google Assistant, it's easier than ever for users to find your app. Updates to the app directory: We're adding what's new and what's trending sections in the app directory within the Assistant experience on your phone. 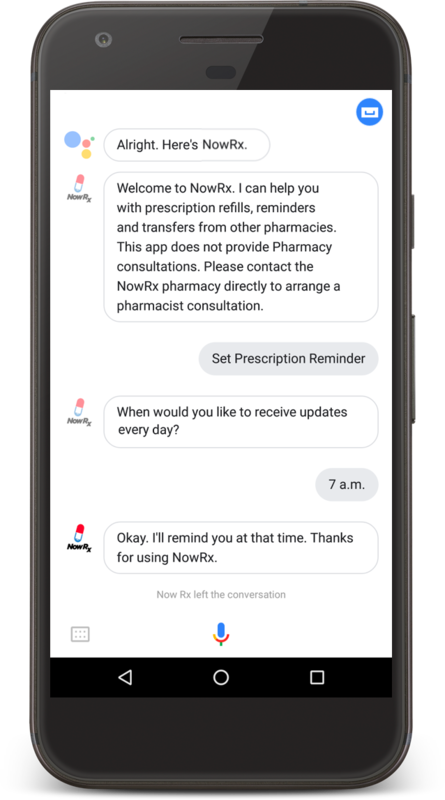 These dynamic sections will constantly change and evolve, creating more opportunities for your app to be discovered by users in all supported locales where the Google Assistant and Actions on Google are available. We're also introducing autocomplete in the directory's search box, so, if a user doesn't quite remember the name of your app, it will populate as they type. New subcategories: We've created subcategories in the app directory, so if you click on a category like "Food & Drink", apps are broken down into additional subcategories, like "Order Food" or "View a Menu." We're using your app's description and sample invocations to map users' natural search queries to the new task-based subcategories. The updated labelling taxonomy improves discovery for your app; it will now surface for users in all relevant subcategories depending on its various capabilities. This change will help you communicate to users everything your app can do, and creates new avenues for your app to be discovered – learn more here. Implicit discovery: Implicit discovery is when a user is connected to your app using contextual queries (e.g., "book an appointment to fix my bike"), as opposed to calling for your app by name. We've created a new discovery section of the console to help improve your app's implicit discovery, providing instructions for creating precise action invocation phrases so your app will surface even when a user can't remember its name. Go here to learn more. Badges for family-friendly apps: We're launching a new "For Families" badge on the Google Assistant, designed to help users find apps that are appropriate for all ages. All existing apps in the Apps for Families program will get the badge automatically. Learn about how your app can qualify for the "For Families" badge here. International support: Users will soon be able to find your apps in even more languages because starting today, you can build apps in Spanish (US, MX and ES), Italian, Portuguese (BR) and English (IN). And in the UK, developers can now start building apps that have transactional capabilities. Watch the internationalization video to learn how to support multiple languages with Actions on Google. Speaker to phone transfer: We're launching a new API so you can develop experiences that start with the Assistant on voice-activated speakers like Google Home and can be passed off to users' phones. Need to send a map or complete a transaction using a phone? Check out the example below and click here to learn more. Build personalized apps: To create a more personal experience for users, you can now enable your app to remember select information and preferences. Learn more here. Better SSML: We recently rolled out an update to the web simulator which includes a new SSML audio design experience. We now give you more options for creating natural, quality dialog using newly supported SSML tags, including <prosody>, <emphasis>, <audio> and others. The new tag <par> is coming soon and lets you add mood and richness, so you can play background music and ambient sounds while a user is having a conversation with your app. To help you get started, we've added over 1,000 sounds to the sound library.Listen to a brief SSML audio experiment that shows off some of the new features here 🔊. Cancel event: Today when a user says "cancel" to end the conversation, your app never gets a chance to respond with a polite farewell message. Now you can get one last request to your webhook that you can use to clean up your fulfillment logic and respond to the user before they exit. Account linking in conversation: Until today, users had to link their account to your app at the beginning of the interaction, before they had a chance to decide whether or not account linking was the right choice. With the updated AskForSignIn API, we're giving you the option of prompting users to link their account to your app at the most appropriate time of the experience. To keep users coming back to your app, day after day, we're adding some additional features that you can experiment with – these are available this week for you to start testing and will roll out to users soon. Daily updates: At the end of a great interaction with your app, a user might want to be notified of similar content from your app every day. To enable that we will add a suggestion chip prompting the user to sign up for a daily update. Check out the example below and go to the discovery section of the console to configure daily updates. Push notifications: We're launching a new push notification API, enabling your app to push asynchronous updates to users. For the day trader who's looking for the best time to sell stock options, or the frugal shopper waiting for the big sale to buy a new pair of shoes, these alerts will show up as system notifications on the phone (and later to the Assistant on voice-activated speakers like Google Home). Directory analytics: To give you more insight into how users are interacting with your app on the mobile directory so you can continue improving the experience for users, we've updated the analytics tools in the console. You will be able to find information about your app's rating, the number of pageviews, along with the number of conversations that were initiated from your app directory listing. Phew! I know that was a lot to cover, but that was only a brief overview of the updates we've made and we can't wait to see how you'll use these tools to unlock the Google Assistant's potential in new and creative ways. So, I guess that Google support spanish for Google Home from today, right? Really? Brazilian Portuguese and not the original language? I'd say I won't talk to you anymore, but then again, you probably wouldn't understand. there are more people living in the city of são paulo than in portugal, the country. so it explains a lot. Still waiting on phone call capabilities in the UK. This this still scheduled for end of 2017? Good stuff, Brad. Can't wait to try out all the new features...esp daily updates and push notifications! Hey Google! What about Swedish? Yeah but we really like good tech. Assistant would be popular. Android pay just launched in Solovakia. There is only 5 mil people there. Half the population on Sweden. That is not logical either. Så jag håller med dig Mats, det skulle var nice med Svenska. Hey Google, how about a choice to slow down the speech. Speaks too fast for many seniors and those of us who use hear aids. We just got that: tag in SSML. Are home automation actions supported via Android watches? Did the feature exist and then was it removed? Does it still exist just some watches don't work? I feel like my Moto 360 Sport with Wear 2.5 should be able to but only pulls up Searches. And googling for answers is a nightmare with all the vague naming. Via Google Assistant, of course, if that wasn't clear! Yes, if you are accually using Google Assitant. Make sure the watch is set to one of the supported Assitant Languages. Otherwise you get Google Now, whitch looks about the same on watches. Is there any way to tell the difference? I'm using English US so I don't think it's the language. Google app is v7.14.21 on both watch and phone. If you are supporting Portuguese BR, why not support Portuguese PT? This is very frustrating. I'm italian and for now assistant is a bit stupid: if I change a single word for a request it replies with a web search. How can I be helpful to improve it? Has sense to write a feedback to every wrong answer? When is the Dutch version comming out? Alot of Dutch programmers are waiting for the release! I so regret to have bought these speakers! Half of the functions are not available in the UK such as different voices or being able to make calls/send text message! it is UNACCEPTABLE to launch stuff for just 1 country! On top of that the speakers are much more expensive in the UK compared to the US and we get much less functionalities for it! No support for Progressive Web Apps yet? These are great developments. The assistant framework will eventually revolutionise the way we interact with the web. 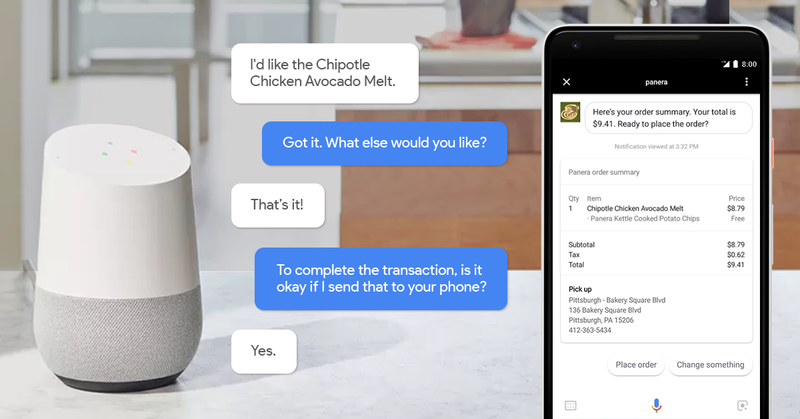 Organisations need to start thinking about how they hold and serve content - the traditional method of serving mass content via websites will gradually change into Micro content served via apps like the assistant in a more conversational / interactive manner - another benefit of AI. Gosh, these are a lot of great updates. You guys are really accelerating! Complete fail. Still can't get my google home to control my 2017 sony android TV. If it is available it is way hard to find and what looks like the function doesn't work. Garbage in my opinion. At least i can turn my TV on and off and control the volume with Alexia. Poor job google for ease of use and functionality.